In this tutorial, we are going to learn how to generate report in angular 6 and ASP.NET Core application. There are lots of reporting tools in angular. 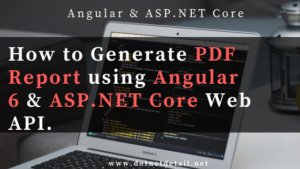 But now in this tutorial, we are going to use jspdf to generate pdf reports in angular 6 with very basic example.